Hotlink Postpaid Flex is a postpaid (not prepaid) mobile plan operated by Maxis. At a monthly fixed cost of as low as RM30, you can get unlimited voice calls, unlimited SMS and 1GB of high speed data usage. After the data quota used up, you can still use the Internet at capped speed for no additional charge. Unlimited Social (RM10) - Facebook, Instagram, Snapchat, Pinterest & Twitter. Unlimited Music (RM10) - Spotify, Joox, Saavn, KK Box & Smule. Unlimited Chat (RM5) - WeChat, WhatsApp, Line, IMO, QQ & IM. These apps-based unlimited Internet access bundles are sharable via mobile hotspot tethering, although the tether speed will be capped at 5Mbps. However, only the base Internet plan can be tethered, and these additional Internet pass cannot be tethered to share with other devices. Note that these are mid-range Android smartphones, which performance is not comparable with high end or flagship smartphones. You can install the Hotlink Flex app available in Google Play Store or iTune App Store to manage your account and monitor your high speed Internet data usage. 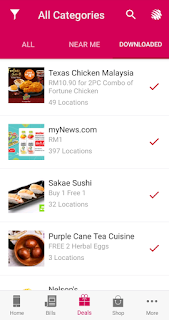 Note that the app for this Hotlink Postpaid Flex plan is called Hotlink Flex, not the other Hotlink RED (for Hotlink prepaid users) or MyMaxis (for Maxis postpaid users). 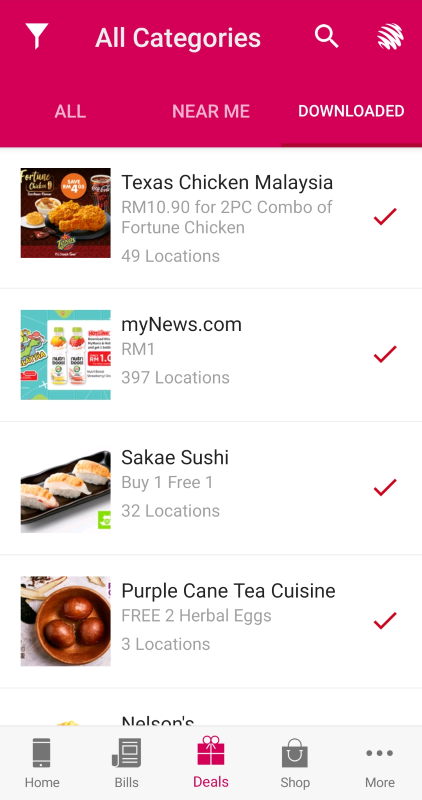 Inside the Hotlink Flex app, there are also quite a number of hot deals containing discount e-voucher as a kind of benefit to its users. Note that as this is a postpaid plan, Maxis will charge you RM10/month to send itemized paper statement to your address. This is considered pretty expensive. Even if you opt for the summarized paper statement, it will also cost you RM5/month. You can eliminate this monthly charge by opting for eBill to have your monthly statement sent to your email address instead. eBill is free of charge. You can switch between eBill and paper statement inside the Hotlink Flex app. You can also set up Direct Debit to have Maxis auto-charge your credit card for monthly payments, so that you don't have to worry about handling your monthly payment. Hotlink Flex app contains a direct web link for you to manage your Direct Debit instruction, which you can register, change credit card, suspend, reactivate or terminate your Direct Debit with Maxis. To subscribe or port in to this Hotlink Postpaid Flex plan, you will need to visit a Maxis Store. Your SIM card will be given to you on the spot. If there is available stock for the Vivo phone and you are subscribing to the Hotlink Postpaid Flex Plus plan with contract, you can also straight away carry your phone back from the shop. This is quite a cost effective plan, especially for those who can make good use of the unlimited calls and unlimited SMS (e.g. businessman, sales person, agent, remote support person, etc. who needs to make a lot of calls and/or SMS every month). After all, Maxis is still the industry leader with good and stable 2G/3G/4G network coverage and speed that you can rely on.